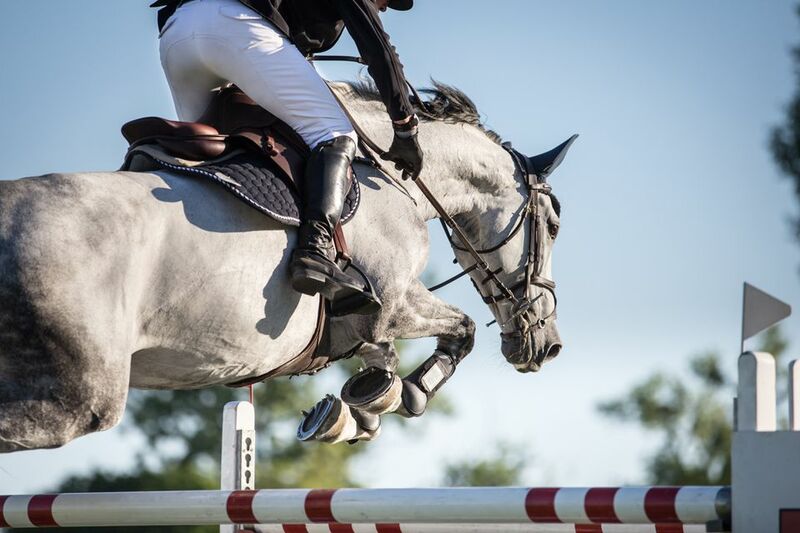 Show jumping, also known as stadium jumping, are brightly colored events. They're often decorated with either natural or artificial elements and placed in a way that is challenging for both horse and rider. The goal of show jumping is to demonstrate speed and agility by avoiding penalties, such as knock downs while being timed. Judging in this event is not based on the horse’s obedience or the rider’s form. Course designers typically create courses with jumps placed in tricky combinations, creating lots of twists and turns along the way. In a Fédération Equestre Internationale (FEI) competition, such as the WEG (World Equestrian Games) or the Olympics, there are strict rules about the construction of jumps. However, local shows may be more lenient. Here are some of the most common jumps used in stadium-show jumping competitions. The first jump you may ever encounter will probably be a cross rail. They’re not usually seen in competition, but you may see them at a schooling show or in the warm-up ring. They’re inviting to the horse and rider because, with a low midpoint, they help both parties focus on jumping. Verticals are often used in combinations of jumps. A vertical is a deceptively simple jump but can be one of the most difficult to clear. It’s usually comprised of parallel rails or boards between two jump standards, although other decorative elements may be used. These jumps can look 'airy' and easy to knock down--and therefore test the rider to make a horse give its best effort. 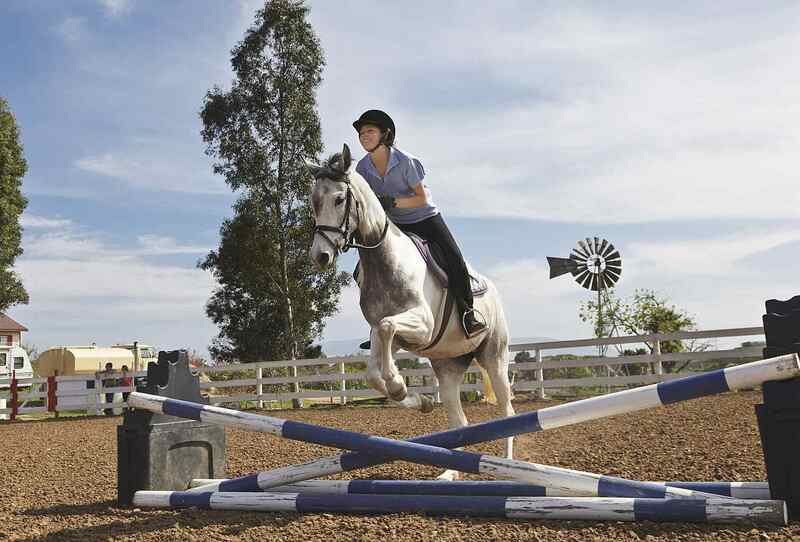 Verticals, and many other jumps, may have wings which are used to help focus the horse into the center of the jump. There is often a ground rail placed in front of most jumps, to help the horse and rider judge distance and height. Lack of either can make the jump more difficult. An open water jump consists of clearing a rectangular square of water that challenges the horse and rider to jump wide, rather than high. There is no fence that the horse must jump; although fences might be used to mark the sides. If the horse touches the water, or edge of the jump with any foot, it is considered a fault for scoring. Plasticine covers the edge of a water jump landing side as a way to measure if a horse has cleared the water. This type of molding clay indents if the horse’s hoof print if it hits it. An indent in the plasticine or a splash will indicate a fault, the equivalent of a knock down. A Liverpool is a type of water jump. It is similar to an open water jump, but includes a fence before, over, or on both sides of the water. The horse must clear both the fence rails, and the water. The obstacle in this jump is typically not as wide as an open water jump. Walls are often decorated to look like real stone or brick. But they are constructed to be lightweight and fall down easily. They look intimidating. So they present a mental challenge even though they might not be the highest or most difficult jump on the course. A combination is a line of two or more obstacles. Combinations test the horse and rider’s control and precision. Often, the jumps are placed close together so that there is only room for one or two strides between. A triple bar, made up of three sets of jump standards beside each other, challenges the horse to jump wide. Wide jumps like these are sometimes called spread jumps. The first bar of a triple is usually the lowest. One variation of the triple is known as the hogsback. In this type of fence, the middle pole is the highest. Another variation is a fan, in which the three bars are on separate standards. So when viewed from above, the fence is the shape of an unfurled fan. Jumps like this present a mental challenge as well as physical one.